During the previous war with the United States, the War of American Independence, Nova Scotian towns had been raided and looted. This would not be the case during the War of 1812. In the years between the two conflicts, the colony had matured and with the arrival of Sir John Coape Sherbrooke as the new Lieutenant Governor of Nova Scotia in 1811, Nova Scotia was better equipped to defend itself and take the war to the enemy. After many recent victories in the Napoleonic Wars, the Royal Navy had expected to easily defeat the smaller and less tested American Navy. Initially, this assumption was proven false. The American Navy had newer, faster, and more heavily armed ships compared to the relatively few British vessels in North America, resulting in the Americans winning several single-ship naval battles during the first year of the war. The capture of USS Chesapeake by HMS Shannon in the second year marked a turning point for the Royal Navy. On June 1, 1813, Halifax-based HMS Shannon challenged newly refitted USS Chesapeake to a battle off Boston Harbour. Despite the fact that the ships were evenly matched, Chesapeake was captured in less than fifteen minutes in what would become known as one of history’s deadliest single-ship actions. When the vanquished American ship was taken to Halifax on June 6, the streets were abuzz with victory. Over the course of the war, the Royal Navy captured dozens of American privateers and hundreds of American merchant ships. Between 1812 and 1815, over 8,000 Americans were held at Nova Scotia’s prisoner of war camp on Melville Island and despite regular prisoner exchanges, the conditions were often cramped and unsanitary, which led to the outbreak of numerous infectious diseases. Nearby Deadmans Island would become the final resting place for nearly 200 American prisoners who died from illness or battle wounds. At the end of the war, Melville Island was transformed into temporary housing for Black Refugees fleeing slavery in the United States. “An Artifact from the Heart of a Deadly War of 1812 Battle” is a blog post about the bell from the HMS Shannon, written by the Maritime Museum of the Atlantic’s curator of Marine History, Dan Conlin. In June 2013, the Maritime Museum of the Atlantic put the “1813 Halifax Naval Yard Diorama” on permanent display. Made by museum volunteer, Mike Oddy, this diorama shows the Halifax waterfront as it looked in 1813 when the Shannon and Chesapeake arrived. “The Battle between Shannon and Chesapeake” is an article on the Department of Communities, Culture and Heritage website that details the infamous battle. The website for Halifax’s Old Burying Ground Foundation provides a history of the final resting place of several significant War of 1812 historical figures. 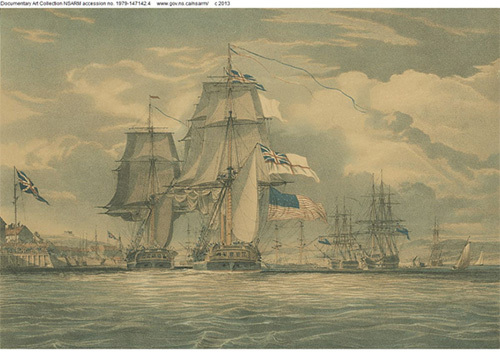 In June, 2013, the 200th Anniversary of the action between HMS Shannon and USS Chesapeake was marked with a commemorative ceremony [PDF 737 KB], which included an inspection of the Maritime Forces Atlantic Honour Guard, a ceremony at St. Paul’s Church, and a commemorative service at the Old Burying Ground.